The Mirabella House at 38 Henry Street, East Keilor, was erected in 1966 for prominent Italian businessman Paolo (Paul) Mirabella and his wife Silvana. Designed by architect Ermin Smrekar, a young Italian designer who had only just opened his own practice in Melbourne, the house is an individualistic composition in what has been termed the Mediterranean idiom, having curved corners and steel-framed windows, a tiled hipped roof, ornate mild steel grille-work, terrazzo paving and an elaborate garden. The Mirabella House is of historical, aesthetic and architectural significance to the City of Moonee Valley. 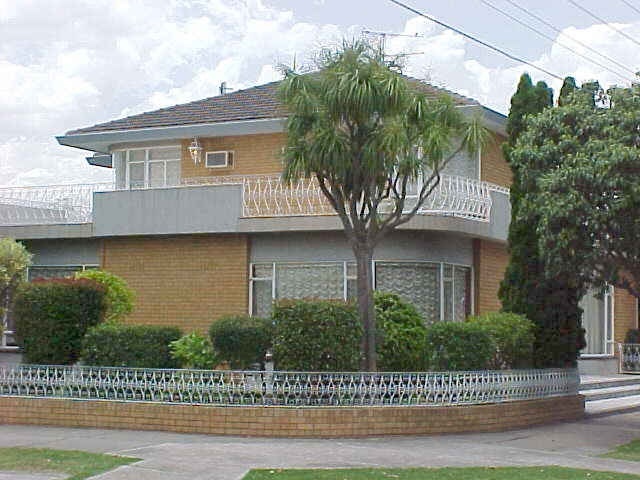 Historically, the Mirabella House is significant for its associations with post-war immigration in Melbourne, being a representative and early example of the distinctive type of houses that Southern European migrants built for themselves at that time. It is also of historical interest as one of the first houses to be erected in this part of East Keilor, and as the home of prominent Italian businessman Paolo Mirabella, later founder of electric lighting company Mirabella International and president of the Italian Chamber of Commerce. Aesthetically, the Mirabella House is significant for its highly unusual form and detailing. It is a fine and remarkably intact example of the so-called Mediterranean idiom, a bold and deliberate nostalgic sub-style that characterised the houses of Southern European migrants in the post-war period. With its double-storey scale and eye-catching integration of materials such as terrazzo, wrought iron, textured render and face brick with deeply raked joints, its stands out from the conventional brick veneer houses that proliferate in this part of East Keilor. It remains as a prominent element in the streetscape, forming a minor landmark on this large corner site near Milleara Road. Architecturally, the house is a significantly early example of the work of Ermin Smrekar, an Italian emigre architect whose highly idiosyncratic work is characterised by an eclectic use of building materials and stylistic allusions, frequently combined in a bold, ironic or unconventional manner to achieve a unique effect. Described by one critic as 'the king of kitsch', Smrekar is best known for the celebrated Old Melbourne Motor Hotel in North Melbourne (1970) and the San Giorgio Restaurant in Cardigan Street, Carlton (1973; demolished) as well as many other hotels, motels, shops and restaurants throughout Australia, although his extensive practice also included houses (many for Italian clients), churches and schools. This large double-storey house has textured beige brick walls, with deeply raked joints, and a hipped roof of glazed terracotta tiles. The ground floor is larger than the first, forming a wide terrace to three sides at the upper level. Both levels have curved corner windows with steel-framed sashes, waterfall curtains, and, at ground level, rendered pebble-dashed spandrels. The terrace has ceramic tiled edging, and is encircled by pebble-dashed dwarf walls and ornate mild steel balustrades. The main entrance, recessed behind an ornate grille and gateway, opens onto a terrazzo patio with steps down to Dennis Avenue. The garden is enclosed by a low brick wall with matching mild steel balustrade, and includes crazing paving, garden beds edged with Castlemaine slate, river pebbles, palms trees and other plantings typical of the era.